Philip Browne vows to fight until the last possible minute ahead of Wednesday’s 2023 vote. 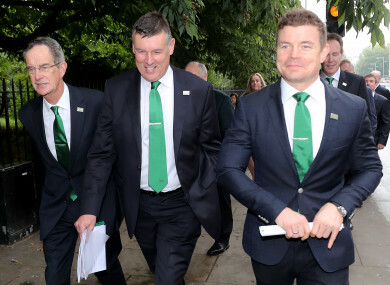 Spring, Browne, O'Driscoll: Irish bid team not giving up hope. IRELAND’S BID TO host the 2023 Rugby World Cup has been “holed” but not sunk by the report which placed them third of the three bids, said Philip Browne, the IRFU chief. Browne, who wrote a frank letter to World Rugby CEO Brett Gosper this week outlining concerns over the report that placed South Africa ahead of France with Ireland in third, added the team would battle to the end until the first round of voting in London next Wednesday. Browne’s letter, which questioned aspects of the report such as security with all three nations rated the same, followed hot on the heels of French federation president Bernard Laporte also expressing serious reservations about the conclusions. “No doubt about it, we were holed,” Browne told AFP in an interview conducted in his office in Dublin. We don’t think we were holed below the waterline and that is why we are still in the battle and that is why we will keep battling away. Browne admits he has to choose his words carefully so he doesn’t get a rap on the knuckles from World Rugby while also serving the Irish government who, having invested both a lot of political capital and money in the bid, will want answers. “There’s a fine line between whinging and having justifiable concerns round the accuracy of what is contained in a report that World Rugby has placed so much store and weight,” said Browne. Browne, who has been in his post since 1998 and been responsible for successfully guiding Irish rugby from the amateur era to the professional world, believes the prize is still up for grabs though. “[The outcome] is finely balanced amongst the three bids,” said Browne, who has been ringing round other unions sounding them out. That’s the fact. We owe it to ourselves, the government and people of Ireland who have been very enthusiastic about it to fight to the end for it. Browne insists Irish anger is not being directed at South Africa — he calls his South African counterpart Jurie Roux one of rugby’s “gentlemen” — but at the report itself. “There’s all these issues which are difficult for us to understand,” he said. “A World Cup in Ireland would be a particular World Cup, something which fans round the world would have enjoyed,” said Browne. Email “Ireland's World Cup bid: 'We don't think we were holed below the waterline. That's why we will keep battling'”. Feedback on “Ireland's World Cup bid: 'We don't think we were holed below the waterline. That's why we will keep battling'”.